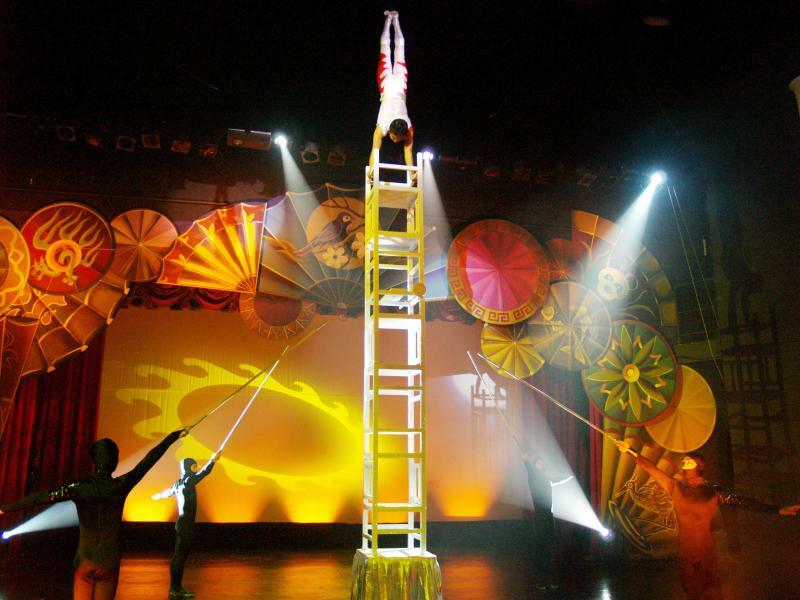 The following performance descriptions are some of the acts featured in shows presented by the Acrobats of Hebei China. This dance has evolved from an old folk dance in China. 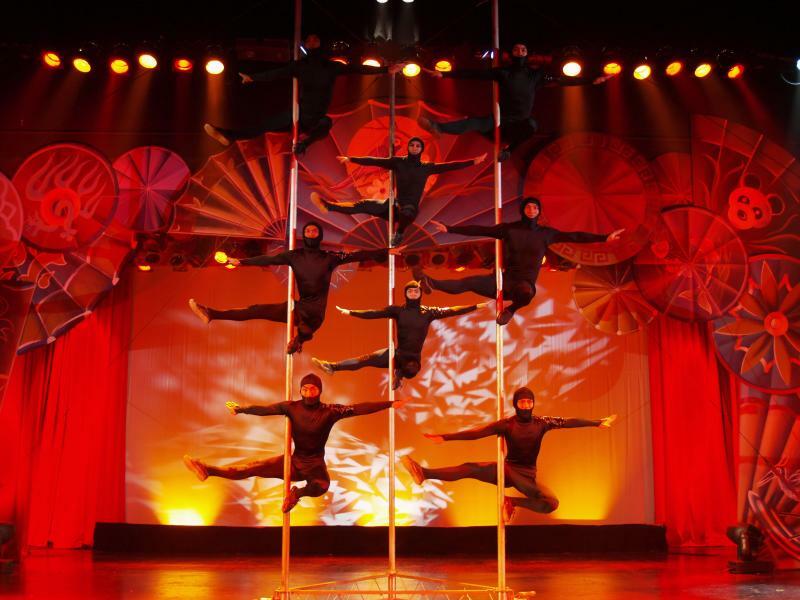 Thanks to the adaptation of the acrobats, it has become a very popular number with audiences. There are two types of lions- big lions (played by two acrobats) and small lion (played by one acrobat). They not only perform the various movements of the lion, rolling and jumping, but also vividly portray the lion's strength and agility, and the quiet and playful side of the lion's character as well. Accompanied by the rhythmic Chinese traditional percussion instruments, it brings out a festive atmosphere, vivid and jubilant. This is an item developed from “leaping through Rings on the Ground” with a long history. It was known as “Swallow Play” more than two thousand years ago because the performers imitated the flying movements of swallows as they leapt nimbly through the narrow mat rings. It was also called “Dashing through Narrows”. The performers are graceful and agile in their movements, demonstrating youthful vitality and breath-taking dexterity. It is derived from Chinese folk physical culture. With movements of somersault, pulling, jumping, kicking and various postures, it has become an acrobatic symbol. The agility, precision and rhythm of their movements convey a sense of vigour, strength and beauty. It is a new development from children's play. Through leaps and somersaults in the air, the acrobats perform graceful movements which give the audience a healthy enjoyment of acrobatic art. Contortionism was a favorite of Chinese emperors, especially the delicate balancing of a multitude of fish bowls, wine glasses, candles, or crystal glasses. Amazing flexibility is required to perform any feat of contortionism. Beginning at home under the direction of acrobatic parents, young children are taught the basic flexing techniques for a future performing career. Female performers are featured in a graceful ballet of balance. A routine that keeps the performers continually moving while they balance numerous bamboo sticks that have plates spinning on top. They are perfect in movement, and beautiful in balance. Martial Arts, various kinds of fighting arts, with or without weapons. Most styles share common physical techniques which include striking or grappling. Striking technique is percussive, using blows with the hands, elbows, feet, knees, and head. Such popular martial arts as karate, kung fu, and tae kwon do fall under this category. Kung Fu, uses open-hand techniques and many Kung Fu styles use such weapons as swords or staffs. Kung Fu is believed to have originated in China more than 2000 years ago. Karate is an unarmed method of self-defense in which a person punches, strikes, kicks or blocks. Karate was directly influenced by the earlier methods of Chinese kung fu. About 100 million people participate in martial arts as a means of self-defense, physical fitness, mental tranquility, and competition. Chair stacking is another example of common household items becoming props in the hands of talented acrobats. Performed solo and in groups, a stack of chairs can reach over two stories high with acrobats balanced precariously on top. A team of performers are a delight to watch as they are featured in a comical routine of Hat Juggling. Fast paced, precise in performance, and choreographed in an outstanding routine. It makes Hat Juggling look easy and fun, but that's because the performers have been raised from childhood to perform this unique act. A routine that is handed down through the ages and it a complete delight for all ages. This is a traditional Chinese sport. During festivals, people vie with one another in playing diablo to express their jubilation. It is imbued with a strong national flavour. The performer spins the diablo rapidly, twirling it round their body, throwing it up or passing it onto another player with grace and dexterity. In the course of spinning the diablo, the players make postures. Accompanied by Chinese national orchestral music, together with the roaring sound of the diablo, an atmosphere of warmth and festivity is brought out. Pole climbing is one of the main traditional acrobatic numbers in China, vivid description appeared in drawings more than 1000 years ago. On the basis of Pole Climbing, new acrobatic movements such as jumping from one pole to the other, swift descent and many others are added. It demonstrates resourcefulness, courage and optimism, and brings the art of pole climbing to a new high level.